Eternal Orthodox Church calendar for the 08.03 year 2017. This great, apostolic man was born a pagan. St John the Theologian brought him to the Christian faith and baptised him. Polycarp was left an orphan in early childhood and a noble widow, Callista, after a vision in a dream, took him in, rearing and educating him as her own son. Polycarp was God-fearing and compassionate from his early years. He made great efforts to emulate the life of St Bucolus, the then Bishop of Smyrna, and of the Holy Apostles John and Paul, whom he had met and heard. St Bucolus ordained him priest and, at the time of his death, proclaimed him his heir in Smyrna. The apostolic bishops, who had gathered for Bucolus"s funeral, consecrated Polycarp bishop. From the very beginning he was endued with the power of wonder-working. He cast out the evil spirit from a servant of some prince and put out a great conflagration in Smyrna by his prayers. Seeing these things, many pagans regarded him as one of the gods. He brought rain in a drought, healed sickness, had the gifts of insight and prophecy, and so forth. He suffered in the time of the Emperor Marcus Aurelius. Three days before his death, he prophesied: "In three days I shall be consumed by fire for the sake of the Lord Jesus Christ!" When, on the third day, the soldiers arrested him and took him for trial, he cried out: "May this be the will of the Lord my God!" When the judge urged him to deny Christ and recognise the Roman gods, Polycarp said: "I cannot exchange the better for the worse." The Jews especially hated Polycarp and endeavoured to have him burned. When they placed him, bound, on the pyre, he prayed long to God. He was very old and grey, and he shone like an angel of God. All the people saw how the flames licked around him but did not touch him. Frightened by such a phenomenon, the pagan judge ordered the executioner to stab him with a lance through the flames. When this was done, a vast flow of blood gushed out and extinguished the whole fire, and his body remained whole and unburned. At the Jews" persuasion, the judge ordered that Polycarp"s dead body be burned according to the Greek custom, and so they dishonourably burned dead him whom they had failed to burn alive. 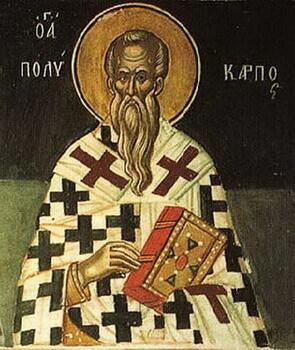 St Polycarp suffered in the year 167, on Holy Saturday. A monk of the monastery of Esphigmenou on the Holy Mountain, he was a contemporary and friend of the great Cosmas of Zographou. He lived in asceticism on the mountain of Samareia, between Esphigmenou and Hilandar, and entered peacefully into rest in 1280. A wonderful, fresh smell arose from his grave for forty days after his death. Abbot of Melrose Abbey, Scotland, d. 664. Almost all that is known of St. Boisil is learnt from Bede (Eccles. Hist., IV, xxvii, and Vita Cuthberti). He derived his information from Sigfrid, a monk of Jarrow, who had previously been trained by Boisil at Melrose. St. Boisil's fame is mainly due to his connection with his great pupil, St. Cuthbert, but it is plain that the master was worthy of the disciple. Contemporaries were deeply impressed with Boisil's supernatural intuitions. When Cuthbert presented himself at Melrose, Boisil exclaimed "Behold a servant of the Lord", and he obtained leave from Abbot Eata to receive him into the community at once... When in the great pestilence of 664 Cuthbert was stricken down, Boisil declared he would certainly recover. Somewhat later Boisil himself as he had foretold three years before, fell a victim to this terrible epidemic, but before the end came he predicted thatCuthbert would become a bishop and would effect great things for the Church. After his death Boisil appeared twice in a vision to his former disciple, Bishop Ecgberht. He is believed, on somewhat dubious authority, to have written certain theological works, but they have not been preserved. St. Boswell's, Roxburghshire, commemorates his name. His relics, like those of St. Bede, were carried off to Durham in the eleventh century by the priest Ælfred. In the early Calendars his day is assigned to 23 February, but the Bollandists treat of him on 9 September.